PowerRoll™ automatically adjusts the transmitter output power based on the record status as sent via ZaxNet boosting the output power level up to 125mW while rolling and powering down to 25mW while on standby to extend battery life. Cover four blocks with one transmitter. The TRXLA2.5 which covers blocks 20 through 23 (512-614 MHz) and the TRXLA2.6 covers blocks 23 through 26 (596 - 698 MHz). Totally re-designed on the inside the LA2 has a brand new proprietary digital modulation giving it enhanced transmission distance and a wider tuneable frequency range. Cover four blocks with just one transmitter. The TRXLA2.5 covers blocks 20 through 23 (512-614MHz) and the TRXLA2.6 covers blocks 23 through 26 (596 – 698 MHz). Designed to be lightweight and durable, the LA2 is housed in a high strength, impact resistant nylon polymer casing that provides protection from both corrosion and water damage. 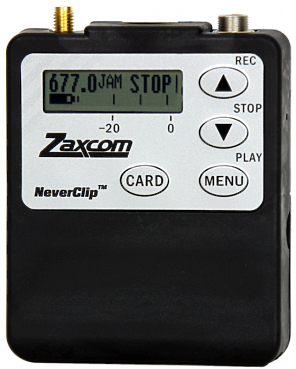 The LA2 is fully compatible with all Zaxcom wireless receivers and IFB transmitters. The LA2 series works with ZaxNet, Zaxcom’s 2.4-GHz RF network that distributes remote control commands, timecode and IFB audio. With ZaxNet, one can remotely control transmitter settings such as gain, frequency channel, transport controls and output power levels. When paired with an IFB100/200 and Deva or Fusion the units can also replay audio via a timecode reference giving production sound mixers the ability to replay and remix audio, creating a virtual multi-track playback and re-record system. The transmitter also sends a Quality Control signal over ZaxNet, a lot of times when you’re micing someone you have to go to the cart to hear how it sounds. Now you can just have an ERX in your pocket and be able to listen to the mic right on the spot. Hire the Zaxcom TRXLA2 Transmitter from Procam. Best service and rental rates for the Zaxcom TRXLA2 Transmitter and all cameras, lenses, sound, lighting and grip.